The days become shorter, the nights colder. But this beautiful, short-lived season ignites the senses like no other. The sights, sounds, smells and best of all, tastes of autumn make us feel all warm inside, even when the temperatures are dropping. If there were a place where autumn lived 356 days a year, it just might be one of the most beautiful places on earth. Slow strolls in the late afternoon sun, when the shadows are long and the light’s gorgeous and warm – it’s what photographers call the Golden Hour. The sun sits low in the sky and bathes everything with a magical glow. We can’t think of a more perfect time to get outside and soak up the season before the snow and bitter cold settle in for a long stay. 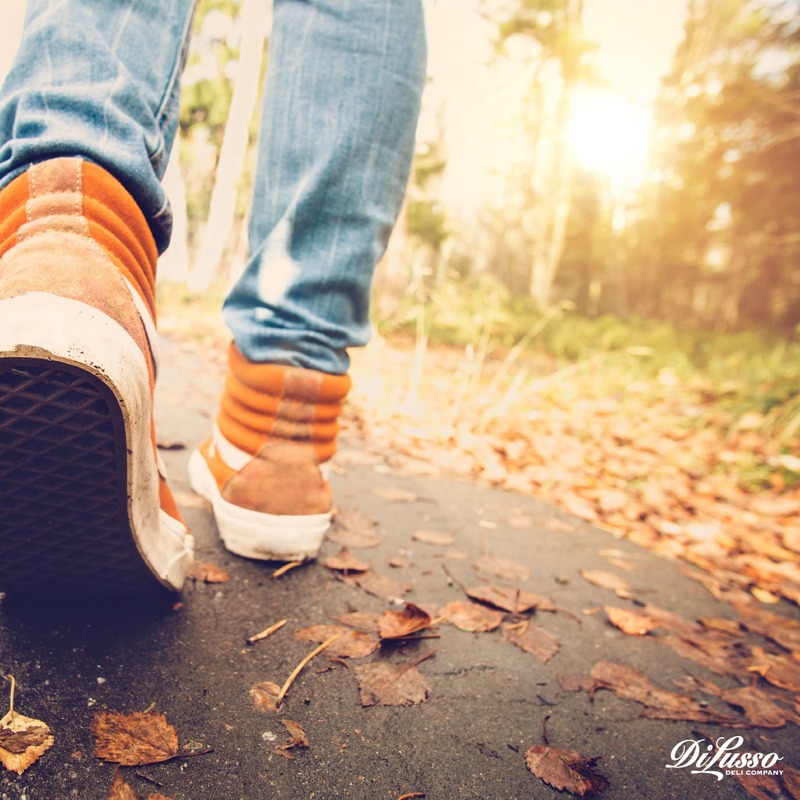 Fall brings with it some of our favorite scents and sounds. The smoky pine fragrance from a wood burning fireplace can fill a neighborhood. The crackling and roar of a bonfire can warm the coldest of nights. Cup your hands around a mug of hot cider and breathe in the cinnamon steam. These are those simple moments we love to hold close. Those brief pauses in our usually busy days that remind us to slow down and enjoy. It’s these simple snapshots that make some of our most cherished memories. Soups, chilis and slow cooker meals were made for this time of year. A simple and perfect menu for curling up on the sofa to catch the new season of our favorite TV show or the Sunday afternoon game. 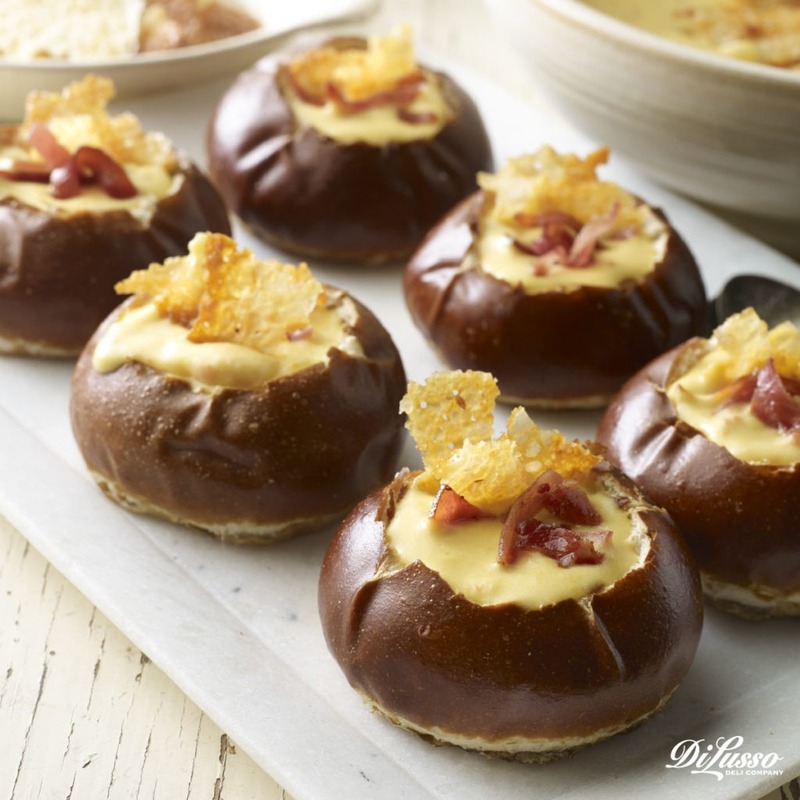 Our Beer Cheese Soup in Pretzel Bread Mini Bowls is perfect for that lazy weekend lounging. The savory blend of Gouda and Cheddar is irresistible. And the scooped out pretzel buns make a beautiful and tasty serving bowl. Top them with these delicious and easy to make Cheese Crisps for added flavor and crunch. We love to go all out with a sprinkling of our Crispy Prosciutto too. 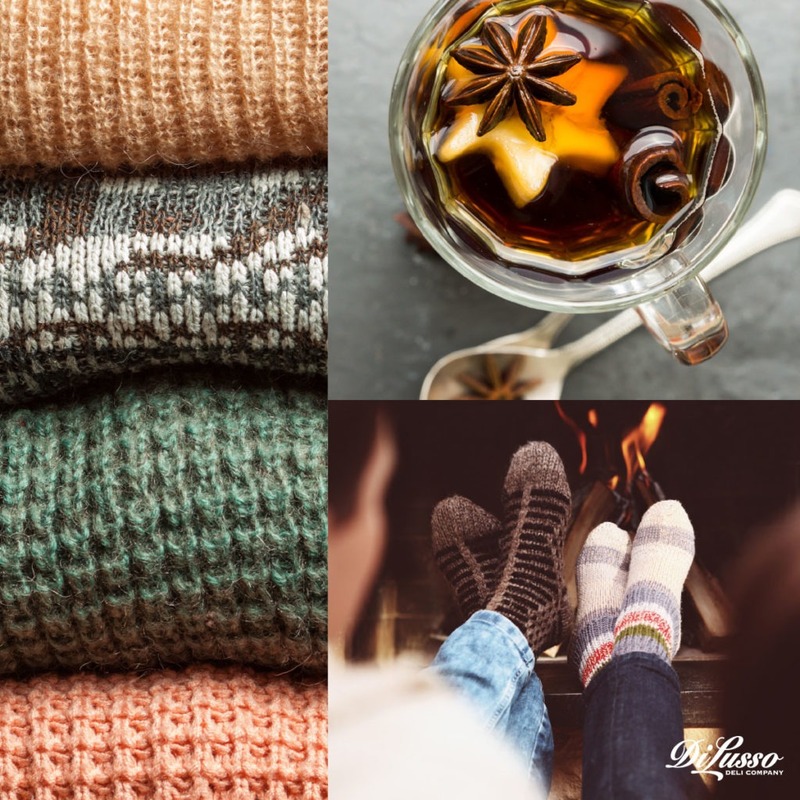 The frenzy of the upcoming holidays is definitely on our radar, but there’s still a few chances to slow down and enjoy some family time at home. Put on your cozy slippers, bring out the board games and enjoy. 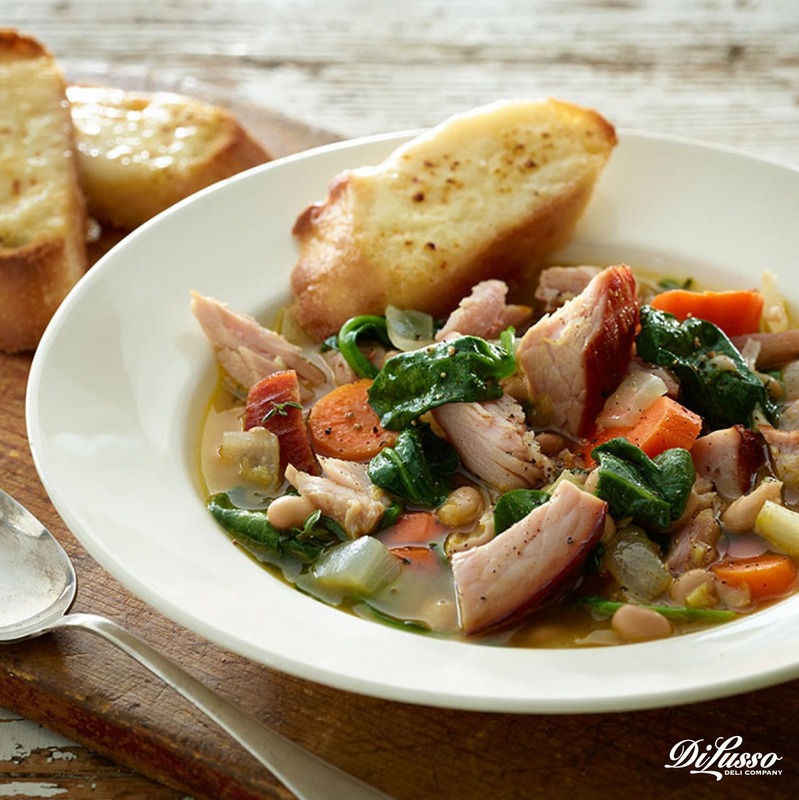 Our Hearty Ham, Bean & Spinach Soup will satisfy the hungriest of gamers and keep the competition friendly.